Spring is a time of renewal -- of nature, of hope, and of the feeling that if you don't take a vacation soon, you're going to have to do something drastic, like quit your job, or cultivate a fierce goatee. 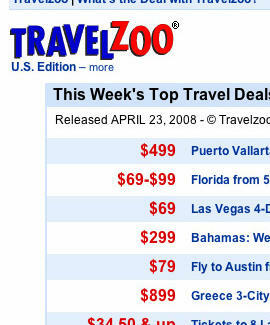 Don't go crazy, just sign up for the free, weekly Travelzoo Top 20® email. Travelzoo works harder than anybody out there to save you money on airfare and lodging, allowing you to shower cash upon people that really matter: souvenir vendors, hotel bartenders, even local law enforcement officials. Their Top 20® email represents the absolute sweetest deals, culled each week from a 900-source database, then sent straight to your inbox. Each package is thoroughly vetted and test-booked multiple times -- ensuring that your exotic resort isn't actually some dingy motel where lowlifes hole up after robbing pharmacies. So go ahead, sign up and check out more deals below -- because your company needs you more than you think, and your chin needs facial hair less than you'll ever want to know. Copyright (c) 2008 Travelzoo Inc. All Rights Reserved.